These properties are prefect for those wanting an experience where you feel like you are away from everyone and everything. 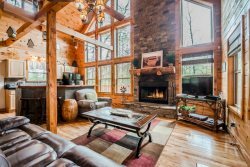 Large & Private Custom Cabin with Sauna, Hot Tub & Game Room. Pet Friendly. 5 Miles to Helen, Ga.